EuroLeague President and CEO Jordi Bertomeu talked to the media in Berlin and discussed the possibility to increase the number of teams qualifying to EuroLeague through EuroCup. 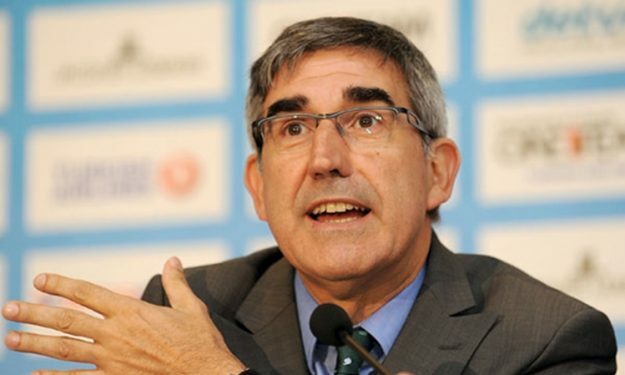 Euroleague Basketball President and CEO Jordi Bertomeu spent time with the German media ahead on Friday ahead of the EuroCup Finals meeting between ALBA Berlin and Valencia Basket. Good afternoon and thank you for joining us today. As always, when we are in Berlin, we are very happy. We are in a city, in a country which is very important for us, Germany. It was important for us, it still is and it will be more important in the future, Berlin and our club in Berlin. We are enjoying the hospitality that Marco Baldi and his team is offering to all the Euroleague staff. We are about to finish the EuroCup season next Monday – it depends on the result today, but according to the schedule, it will be on Monday. We are satisfied and very happy with the evolution and the progress of this competition in the last years. We have measured the growth of the competition from all angles. All the data that we have – attendance, from our digital environment, on EuroLeague TV and on our different social media platforms, in our TV distribution – from all angles that we can measure the competition gives us very good results. We all agree that the level of competition is better every year, every season. On one side, we feel happy and believe it is exactly what we wanted to achieve with the EuroCup since many years ago. And now, we are thinking on how to improve even more the importance of this competition, because it is what we believe in. This competition and the clubs that are competing in this competition deserve to have an even better chance. Based on the fact that the EuroCup is a competition that represents the aspiration of the clubs to go to the top competition in Europe, which is the Turkish Airlines EuroLeague, our idea is to introduce some changes in the near future. Our intention is to introduce for the next season an increase on the number of the teams that will promote from the 7DAYS EuroCup to the Turkish Airlines EuroLeague. You know that according to the current rules, only the EuroCup champion has the chance to play in the EuroLeague the next season. Our intention is that, the sooner the better, and for the next season [qualifying for the 2020-21 season], to have not only the EuroCup champion but also the runner-up to get the opportunity to play the EuroLeague. It is something that, like I said, we will try to introduce at the beginning of next season if the EuroLeague Assembly approves this idea. Together with this idea, we want to introduce some mechanisms that will allow the 7DAYS EuroCup clubs that go to the EuroLeague and perform at a certain level to stay, to remain in the competition. We will start working in the direction of the promotion-relegation system that we presented as a vision five years ago, when we presented an ultimate vision: to implement a perfect pyramid in our structure of competitions going from the domestic leagues to the EuroCup, to the EuroLeague, based on sports results and promotion-relegation principles. Those are our ambitions for the future, which will also be remarkable. For the first time, we will have a stable system for Germany, with at least two German teams participating in the EuroLeague at the beginning of next season, with this expansion to 18 teams. And again, it is one more step forward to the principles of this goal that we established, a pyramid system that, from our point of view, responds to the values and culture of sport in Europe. The concept of promotion-relegation, the concept of improving the quality of the competition by having higher standards and with the ultimate goal of offering our fans, our customers, the best product possible. It is what we are trying to do with the Turkish Airlines EuroLeague and of course, with the EuroCup. We wanted to share these ideas with you. I just want to point out that so far, they are ideas that we definitely want to take the commitment to implement next season. That’s all from our side, taking into account we have the opportunity to spend time with you only from time to time. The last time was probably when we had the Final Four here in 2016. [For ALBA to enter the EuroLeague] It would be a good idea to win today and if it is possible, to win on Monday… There is another chance, which is becoming champions of the BBL, and still a third chance, not being the BBL champion but the runner-up if the champion is FC Bayern Munich. So there are different scenarios that according to the current rules, ALBA can play the EuroLeague next season. But there is no question that we understand there is a very concrete group of teams that have the vision and the aspiration to be part of the EuroLeague, and this EuroLeague that every time is more defined around the concept of stability with a long-term license. Of course, we understand and we know that ALBA has this aspiration, and we recognise that Berlin and the club is one of the candidates to be part of this group in the future. In the meantime, we have these sports mechanisms that allow the club to be part of the EuroLeague. The rules are clear. We have one spot for the BBL that corresponds to the champion of the BBL. In the case of the champions being Bayern Munich, which is already awarded with a two-year licence with a wild card, then we will go to the runner-up. If the runner-up is a team that has no interest to play in the EuroLeague, then we will have the chance to choose the team we want, with no restrictions. We will not take into account the German ranking to choose which team we want. [On Bamberg in EL] Bamberg has been a Euroleague team for many years as a consequence of being BBL champion. Bamberg at the beginning of the season took a decision, and we have to respect the decision. The decision was based on the fact that they prefer to take an easier way instead of trying to play against the best teams in Europe. They decided to have an easier way to win a trophy in the third division competition instead of trying to play and be competitive with the best teams in Europe. That was Bamberg’s choice at the beginning of the season and we respect the decision. We don’t close the door to anyone, but the fact is they took the decision based on this consideration. And probably time proves that they were right because they are about to play the finals of this third-level competition so probably they are close to their objectives and their goals, and we will be happy with this. But if Bamberg according to the rules have the right to play in the EuroLeague, and they want to play in the EuroLeague, we will not close doors to people. We are always ready to talk and respect the decision. Of course we have our opinion but we are not people that if someone takes a decision we don’t like, we forget those guys. Everybody deserves respect and to be considered, but in this particular case it’s Bamberg’s choice. [Are clubs unable to play EL because of their infrastructure?] It can happen, not only in Germany but in other countries, that the team that through their domestic league ranking has the right to play in the EuroLeague, cannot fit the requirements that are in the EuroLeague standards. We have to admit that they are high and affect different aspects of the clubs. It affects minimum budgets, the arena conditions, the facilities of the gym, transportation, location, different aspects. That can happen, honestly. I am not talking about Germany because I am not aware of the conditions of the different candidates, I cannot talk about specific cases. But that can happen as a theoretical case in all the countries, but in this case we have to review the cases in Spain, Germany, the Adriatic League, VTB League. With the example of Buducnost last year, they had some issues with both budget and the arena, and during the summer time they managed to adapt the arena to the EuroLeague requirements and of course they had an effort from an economic standpoint to be able to compete at the level we wanted. They are examples that sometimes we can have options for them to solve the problems, but sometimes it’s impossible because you have a team playing in a 3,000 spectator arena, so it’s impossible to build an arena in one summer. The requirement is 5,000 for the arena capacity, along with other more specific requirements for the arena, and a minimum budget of 5.4 million. They are the main requirements we look at when we are in the registration process of the teams. [Why Bayern got a wild card] We have to go back three or four years ago when the EuroLeague owners identified three markets as our priority markets: Germany, France and the UK. So, from then we have been focussed on how to have a more stable presence in these markets in the EuroLeague. With the current system with 16 teams it was difficult, particularly in France we were out as a consequence of the reduction of the number of teams, because at that time the French teams probably didn’t have the quality to play in the EuroLeague, as was proven by the fact that in the previous seven seasons no French team reached the playoffs. When we decided to expand the league to 18 teams the situation was different, we had the opportunity to include those markers. We always had a team from Germany, and sometimes two when we had the opportunity to award a wild card in the past. When we had to choose one team and one market in Germany, for the circumstances that we had in the moment we were discussing and thinking about it, probably Bayern Munich was a little bit ahead compared to other teams in Germany. But I think throughout our short 19 years history, we proved many times how important ALBA is for us. Many times we have been enjoying the cooperation with the club and always trying to have ALBA with us in the EuroLeague or EuroCup with different wild card systems. For us, clearly Berlin is a market definitely we want to be in. And in the future, knowing the condition and structure of the club, which I have to say is probably one of the best at the EuroLeague level, all these things help us work in the direction that at a certain point we will have a second team from Germany and this second team will probably be ALBA if everybody does their homework. That’s something in the future but there is no doubt how much we want ALBA with us. [About EuroLeague wild cards] If we have a Spanish team as a EuroCup champion, we will not have more than four Spanish teams [in the EuroLeague]. So we will have a wild card and there will be time to see where we can allocate this wild card. We will have to wait until the end of the season. We have to wait until the end of domestic leagues, but I think Germany and Spain are the leagues that finish the latest. Not earlier than this date will we be able to announce teams that will play in the EuroLeague next season. And then, we have to go through a formal proceeding, to present the candidates for the wild cards to our shareholders, and they have to approve it. So a formal decision cannot be made earlier than July 11th. We definitely have to identify, for us, under the concept of a EuroLeague as a professional European league, business-oriented and focused on delivering a high-level product to our fans, which are the cities we have to consider. If you see the EuroLeague map, most of the main European capitals, or major markets like Milan or Barcelona, are on the map. So, Berlin, Paris, London are for us destinations sooner or later we have to be there. According to our idea and concept of the league. And when we say that, we have to consider the level of maturity of each one of these markets. So, clearly, when we compare, it is not the same level. There are also other cities that can be interesting for us – it can be Rome, it can be Turin, it could be other cities included on this list. But honestly, not many.